The Field Trip Hop has a new look and a new title! I have been working with my good bloggy friend Lynda from My Heart's Desire Creations to come up with a new look. I love the old world map look and as we have home schoolers posting their field trips from around the world I thought it was a good theme for the hop. If you are interested in having any work done for your blog I encourage you to contact Lynda and let her help you, she is amazing to work with:)! 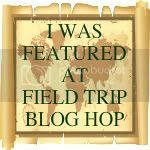 If you are interested in being a guest blogger and have something to say about how you use field trips in your home school please contact me either thru the comments or by email. 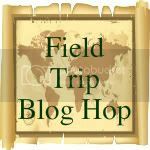 We had over 60 links up last month and I appreciate that so many of you are spreading the word about the hop by telling others about it and showing the Field Trip button. We have a new button to match the banner so be sure to update your blog with the new button as the old button will be deleted this month. Now on to the Field Trips! Please take the time to read a few posts and share some blog love by commenting! Love the new header - vintage and vintage looking maps are so interesting to view. Visiting from NOBH. Cool look! I still have some October trips to post about. Does it have to be something done in November? The new look is great! I love it. This is a wonderful idea and love your header and site style. Just letting you know the History Hop is only for a few more days and I would love you to join in with any history related post. Cheers.